The aim of our team this year is to design and realize a treatment for hemochromatosis and thalassemia using synthetic biology with an integrated human practice and modeling approach. Our project focuses on developing a novel treatment for hematological disorders caused by an iron overload, such as hemochromatosis and thalassemia. These autosomal recessive disorders have symptoms including cirrhosis, arthritis, and heart failure, which result from overabsorption of iron from the duodenum. Although these are among the most common heritable diseases, treatment options are limited. Even today patients are mostly treated by frequent bloodletting, which many people cannot support. The aim of our project is to combat these diseases at the source by developing a therapy that prevents the intestinal absorption of iron. We engineer the Escherichia coli Ferric Uptake Regulation (FUR) system using a genetic inverter so that they produce siderophores (iron chelators) in response of high concentrations of iron. These engineered bacteria are delivered to the patient's intestine by encapsulating them in an ingestible polymer (capsule) that specifically degrades in the duodenum. 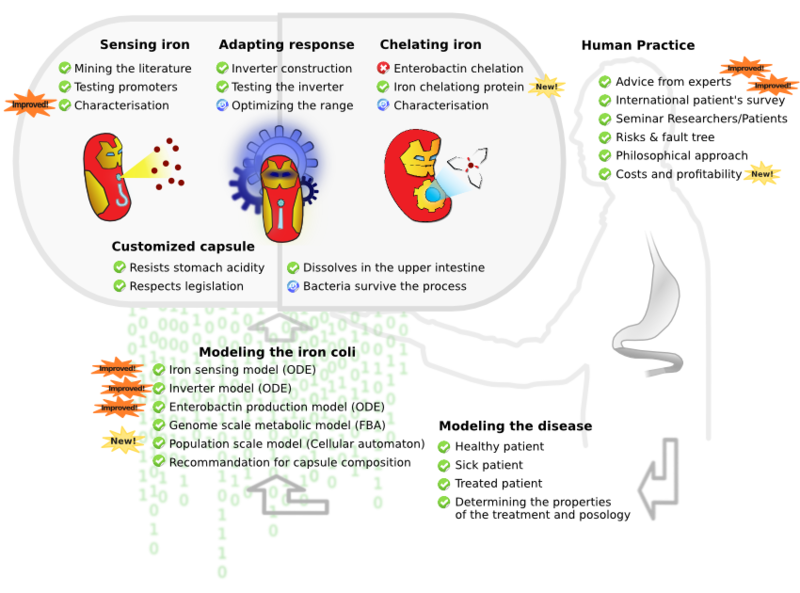 Once released into the intestine, the bacteria respond to ambient iron by secreting elevated levels of siderophores, thereby chelating the iron to prevent its absorption by the patient.